It’s the first morning I have spend in Vietnam and the only one in Hanoi. I woke up very early and even had a restless night thinking all the time about the place we were going to visit and for which we chose to travel to Vietnam, not knowing when I was drawing the route that this country is so fabulous and I would need a few months to discover only a part of her beauties. 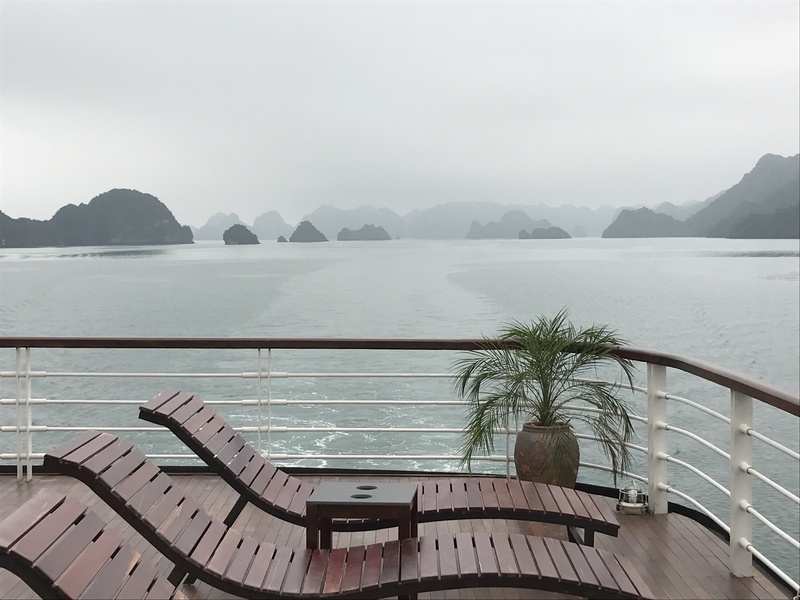 A few hours later we will be on a cruise ship for two days in one of the most impressive places on earth, in a cruise in Ha Long Bay, located in Tonkin Bay, northwest Vietnam, 165 km from the capital Hanoi. 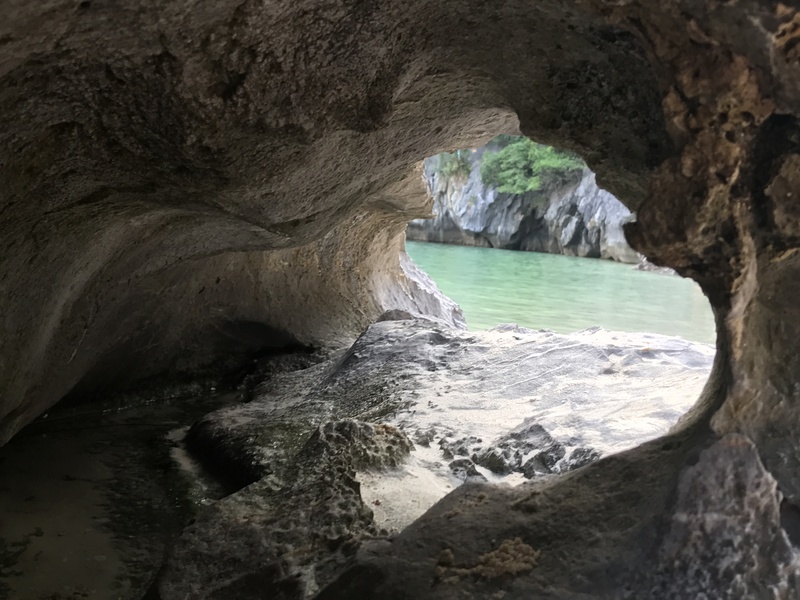 It is part of the UNESCO heritage and comprises about 1900-2000 islands of an unique beauty, with calcareous limestone reliefs, caves and conical peaks. 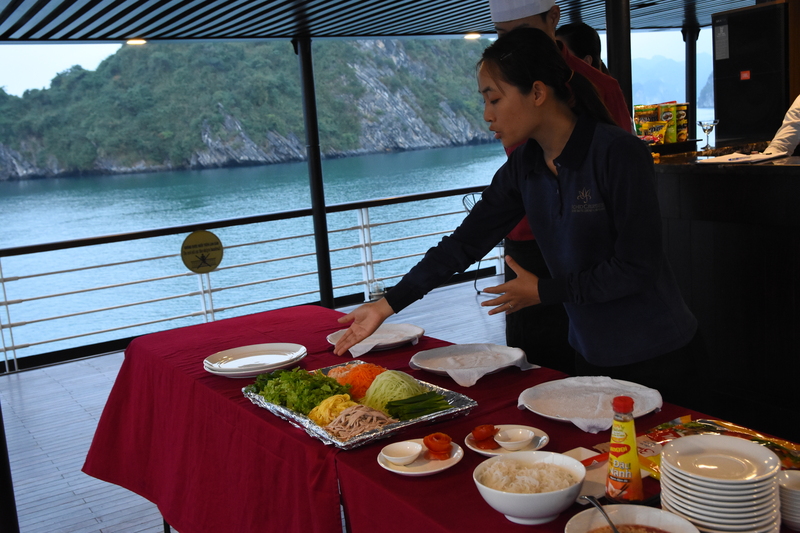 Halonghub is a complete site offering guides and tips for choosing the perfect cruise in Ha Long Bay. A few days earlier we started watching the evolution of the weather in the area and we hoped that in the two days there the sun would be our closest friend. In this morning the city was a heat explosion with a grueling sun from the early hours of the day. At 9 o’clock we had to meet with the minivan driver who was about to take us to the closest place to the cruise. 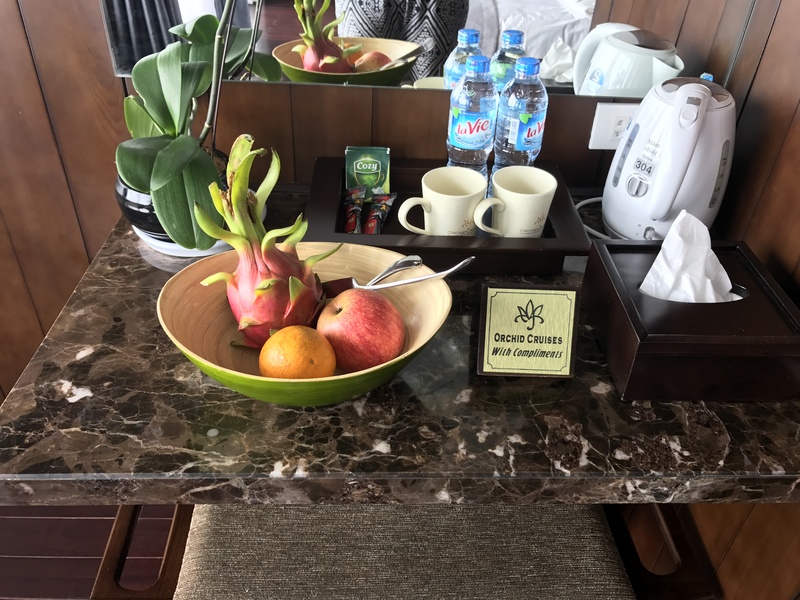 I took a rushing breakfast, more fresh fruit and coffee, and because there was an hour before the transfer, we went out to walk around Hanoi Chic Hotel lanes and see Hanoi by day too because in the evening is superb , I wrote about it here. Lots of fuss, full-packed scooter noises, roasting chickens in “improvised kitchens” on the sidewalks, souvenir shops with wide open doors, street vendors, locals eating on small chairs down the sidewalk, klaxons all over the place and people who slipped among the scooters in an attempt to cross the other side of the streets. I could not believe that, although it was 8 o’clock in the morning, the city was breathing through all pores. 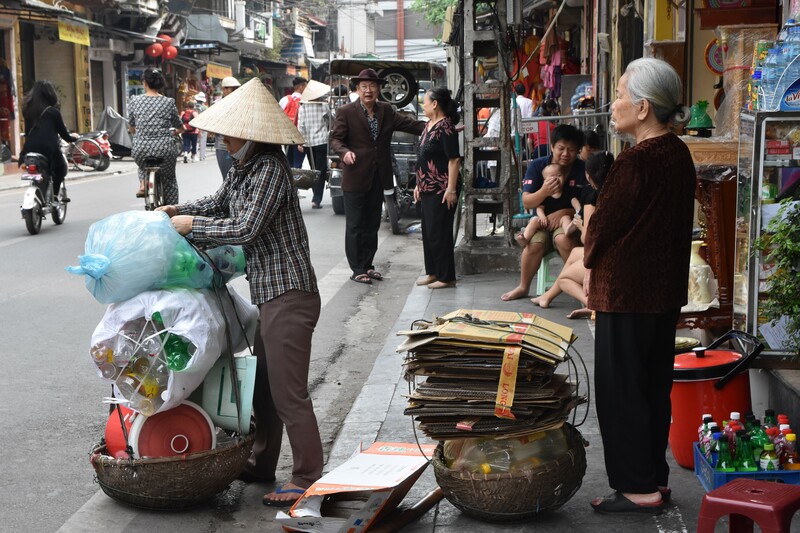 The Vietnamese are full of energy, the same people I found last night in parks, where they relaxed on the mats or chairs until midnight, and now the streets were full again. 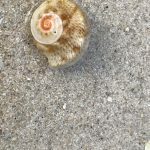 Time pressed and by my husband, I ran into a souvenir shop where I bought two rings made of nacre, and that’s because we still had only hand luggage. And because we were getting signs that the driver had to find us at the hotel, we got back pretty soon. It was not time for detailed decisions so I took the camera and let my husband wait for the car, and I went out in front of the hotel to catch some more pictures. Five minutes later I was a few streets away, happy that at every step I had something to photograph. 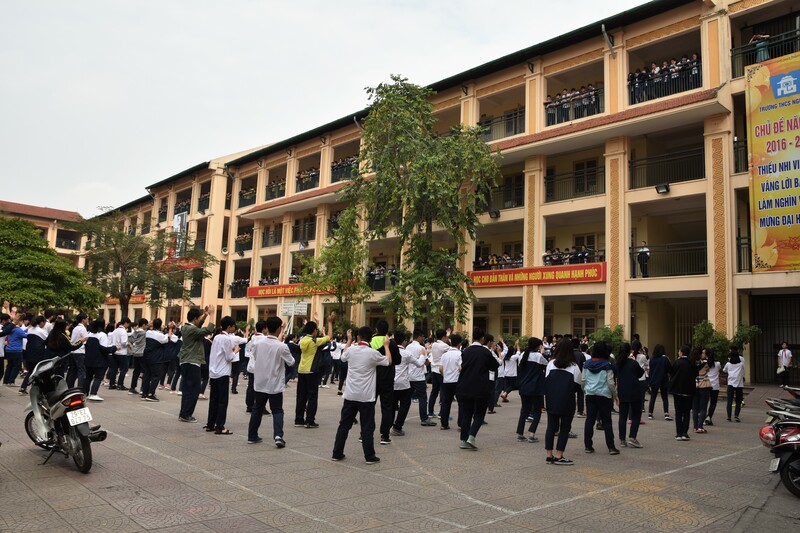 Going chaotic on the streets, I got to a school where there were many kids in the inner yard, singing and doing some kind of rhythmic gymnastics. Other students applauded from the school’s balconies and they were all cheerful and extremely noisy, but very well organized. 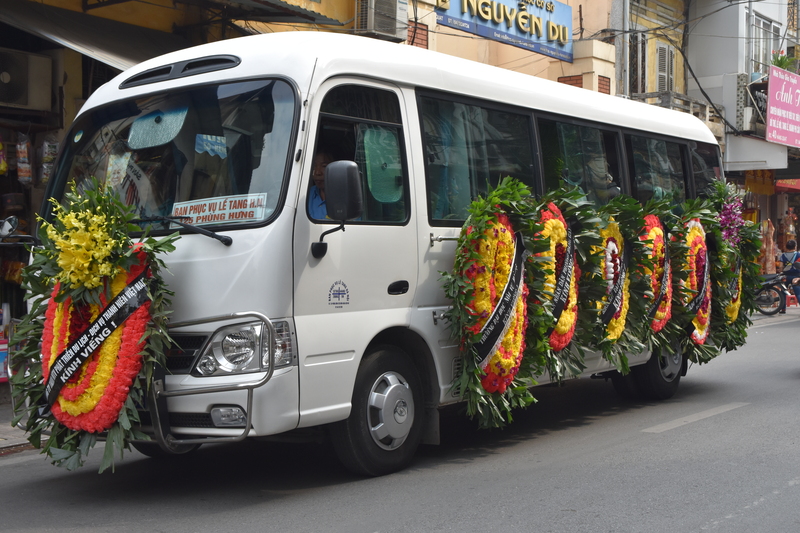 I almost forgot that someone was waiting for me in the lobby of the hotel, when a funeral cortege appeared in the street and absorbed me even more, with different rituals than the ones I knew. 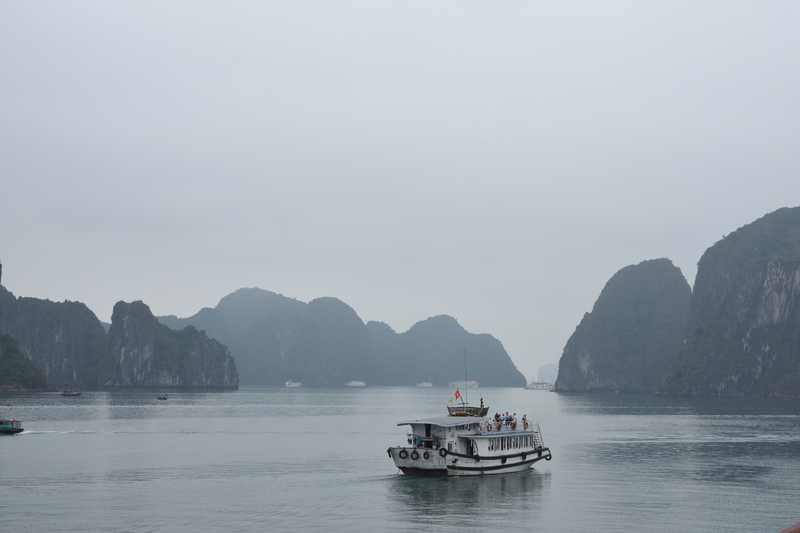 A little time later we left behind Hanoi for a beautiful cruise in Ha Long Bay. 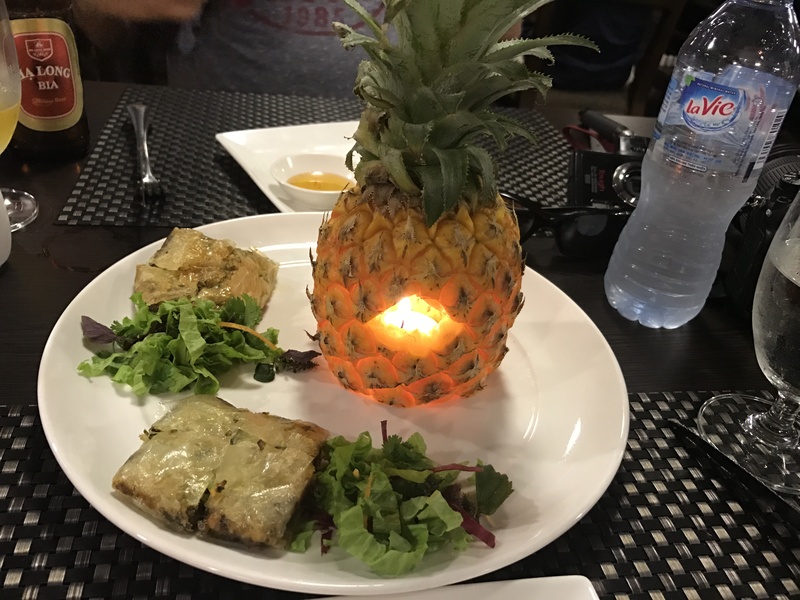 We traveled for about four hours, gazing at the glass, admiring the endless orchards of exotic fruits, the vast rice crops and being impressed by the very carefully groomed cemeteries in the yards of the houses. In Vietnam, the tombs are intensely colored, and the inhabitants of the rural areas bury their family members very close to homes, in the middle of the rice field, to be in constant contact with the remaining relatives because they believe that after a hundred days, his soul re-incarnates. I do not even know how the time has passed and we arrived in Hai Pong, the place where we and other about 20 people have been taken over by other minibuses and transferred to a large boat. 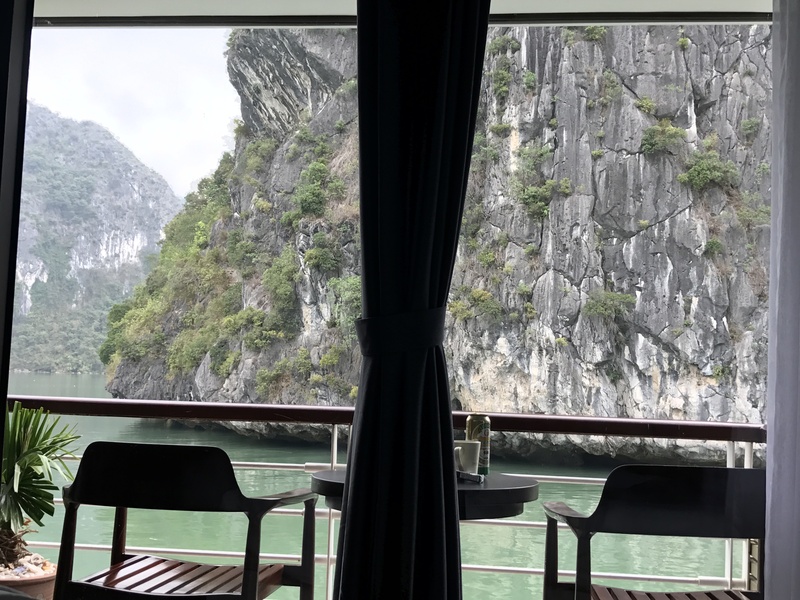 A few minutes later we spotted the Orchid Ha Long Cruise that will host us until the next day at noon. All crew members were on the edge of the ship and were waiting cheerfully, shaking hands in the air in a perfect synchronicity. We got on the boat and were greeted with a cold drink, wet towels and lots of joy. 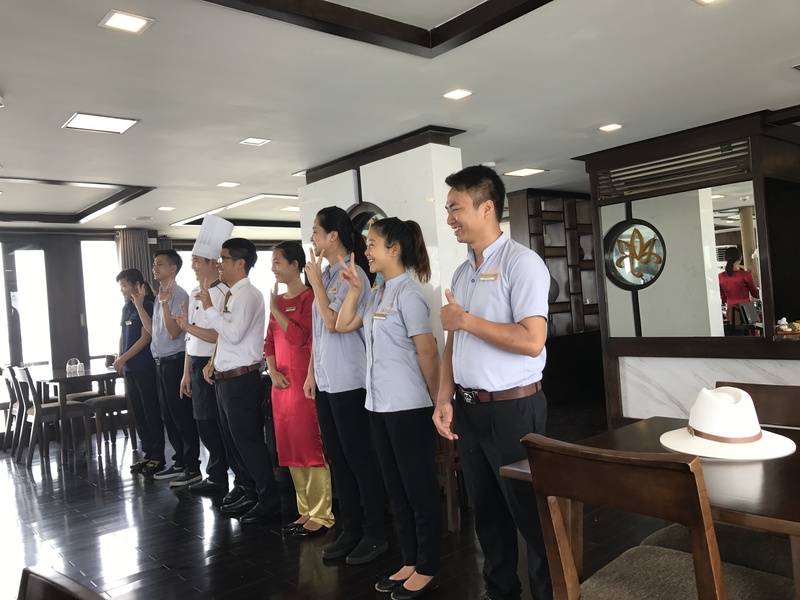 The ship manager, a very nice Vietnamese, welcomed us, briefly detailed the cruise program, handed us the keys to the rooms, and gave us a meeting point in half an hour, at lunch. 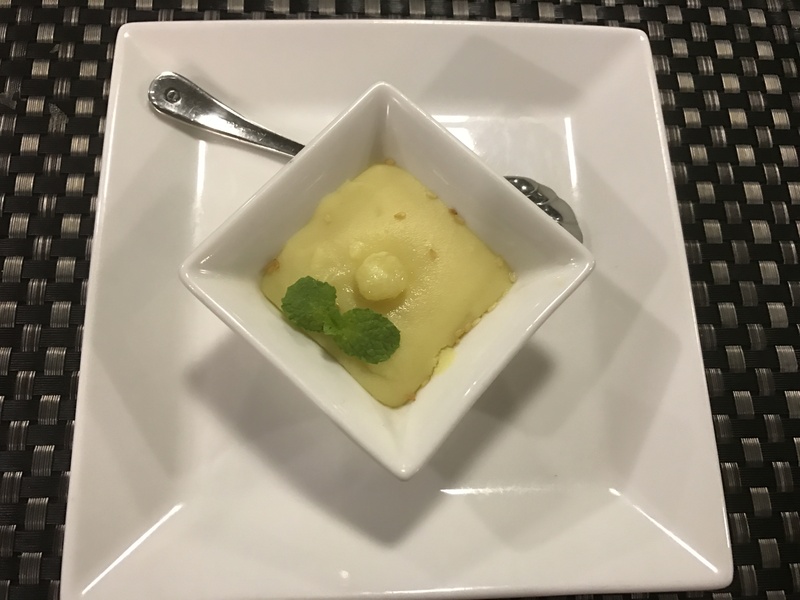 I do not know when the half an hour passed, but we quickly took a shower, we changed, and we were relaxed on the window-facing bed when a waitress knocked at the door and told us we were expected for dinner. 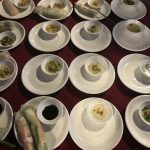 Here were other surprises offered by the crew, many dishes and deserts, all in an elegant setting and surrounded by pleasant people. Captivated by the events, I noticed late that the boat was moving and that some landscapes around us appeared as I had seen in Avatar. 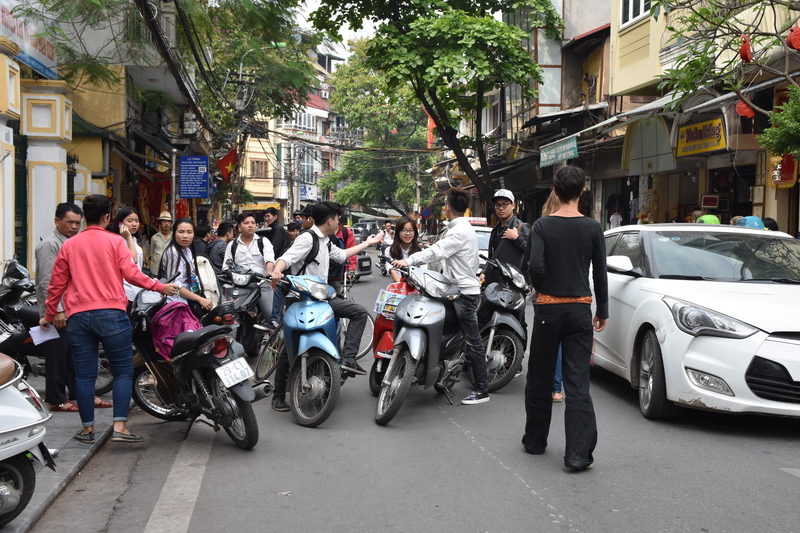 I forgot to say that although in Hanoi the sun was shining and playing with our white skin, things in the bay were totally different: the sky was covered by clouds, outside it was not very warm, but the temperature allowed you to wear a t-shirt. Everything seemed slightly enveloped in the fog, but the nearby cliffs were pretty good, now our greatest desire was not to rain. After a few feet of trembling with fear, I defeated my fear and began to grow both, at first rather lean, then more and more performant. At one point we competed with two girls in the United States who were handling their kayak quite well. 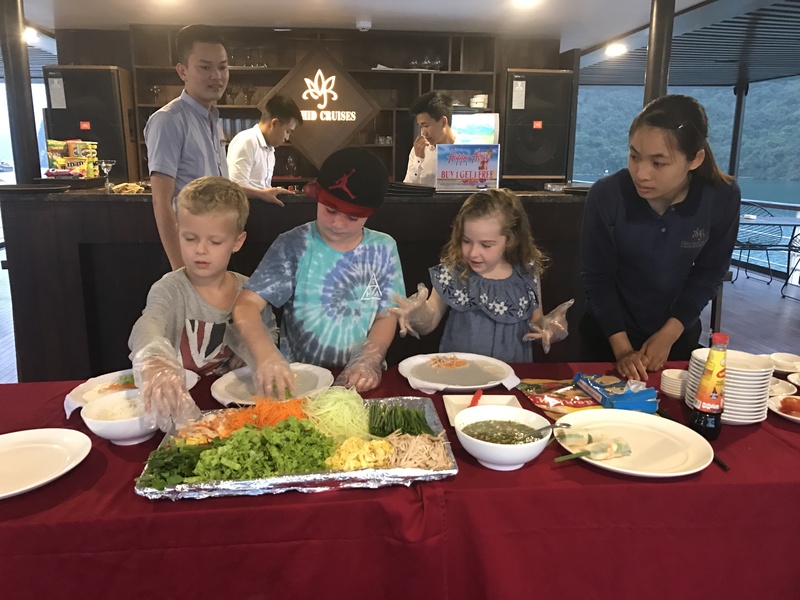 After an hour of pampering on the beach, we returned to Orchid Ha Long Cruise where we attended a traditional Vietnamese food course, attended mainly by the children of the tourists on the boat. 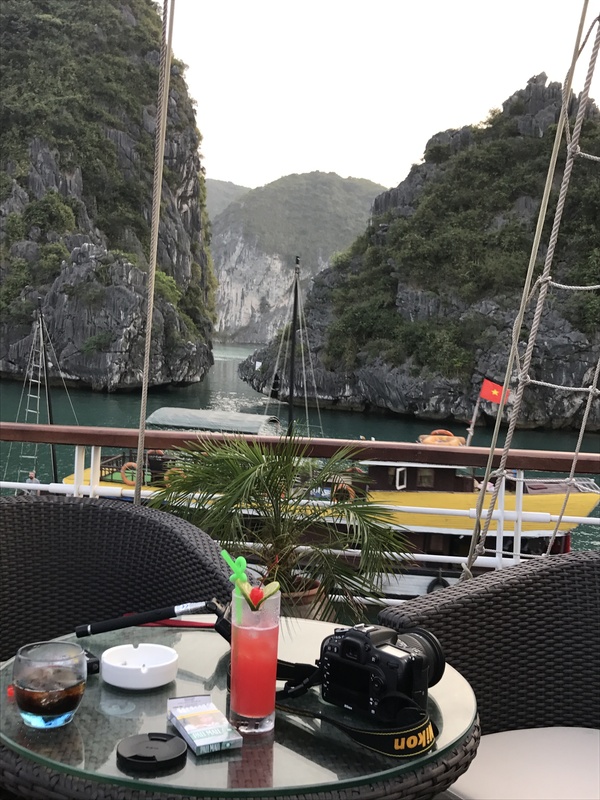 All the facilities were included in the price of 480 dollars that we paid before boarding the boat, except for the alcoholic drinks, for which we had to pay extra. Therefore, in order to facilitate passengers’ access to such beverages, the crew organized happy hour at a paid cocktail, the second one received it was for free. We climbed to the upper floor of the ship and enjoyed some cocktails, enjoying the fabulous view around us. We went down again into the cabin, this time in an attempt to sleep half an hour, because we were already tired, but when we got into the room and draped the curtains had the feeling that we had a TV screen and I was looking at a 3D movie. 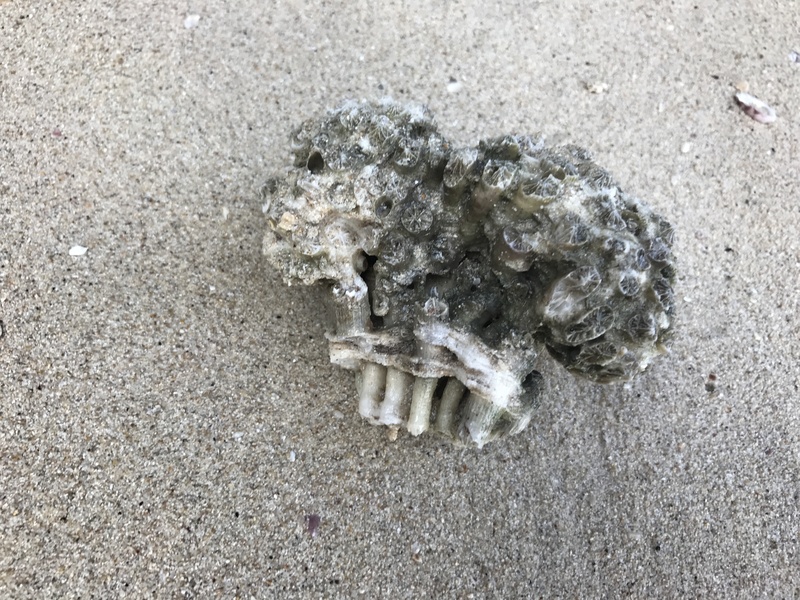 The cliffs were passing by our eyes, moving away from us, and leaving the place for other strange forms of relief that appeared nowhere and revealed their beauty. Just here and there you saw a more worthy bird that was trying to find food on the islets. With this almost fantastic scenery, I was at the edge between dream and reality when we were again called to the table. And we were the last there again 🙂 We sat at a table with an Australian family with whom we talked about the experiences so far and that opened our appetite for Bali. 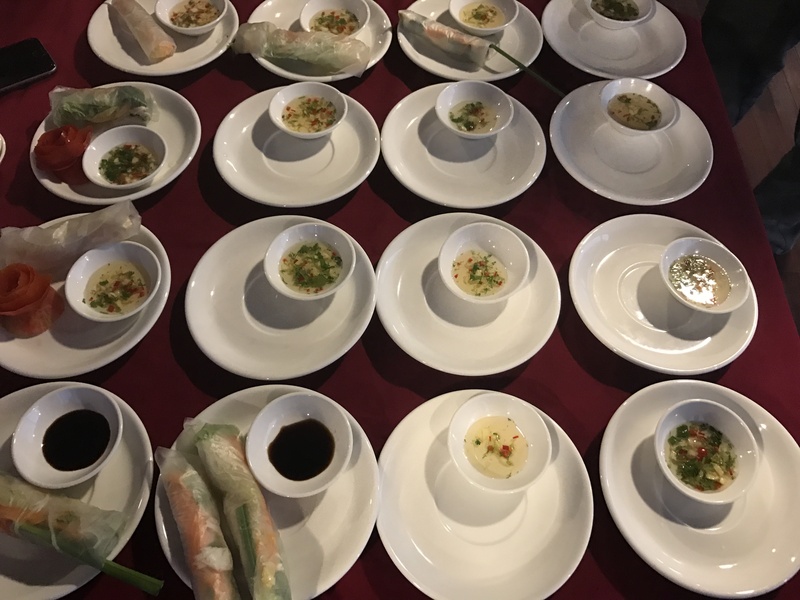 Dinner was impressive, with traditional Vietnamese dishes served in an intimate setting, in the light of pineapple candles, one for each person, brought to us in the applause of all those present. Very many dishes, all equally good and appetizing, followed by happy hour and again cocktails, this time enjoyed in the silence of the night, watching only the big wooded cones that came out of the water. During the night, our boat stood, but we fell asleep slightly by the discreet water waves, the curtains drawn to one side, to enjoy the scenery for as long as possible. I fell asleep looking at the window and woke up in the morning with another sight, although our ship was in the same place. During the night, we twisted in the opposite direction, so in the morning I woke up with a wide opening in front of the window and many rocks in the distance. Sensational! The awakening was at 6 o’clock for those wishing to attend an hour of Tai Chi, but we took advantage of the last minutes of peace to admire nature on the balcony. After a fabulous breakfast, we had an adventure, this time with canoe. We took a tour of the bay in the area where the Toi Sang cave is located, then we went back to the boat for the check-out procedures. 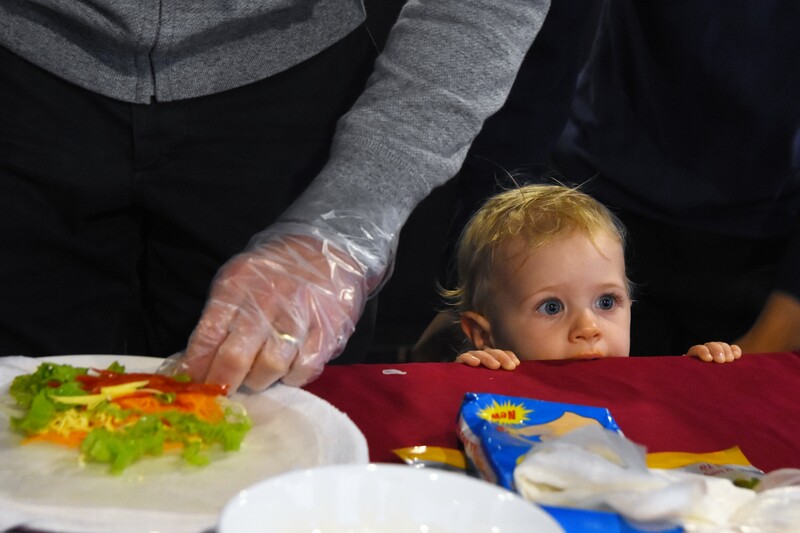 We still had a snack prepared by the crew, but who could eat again? 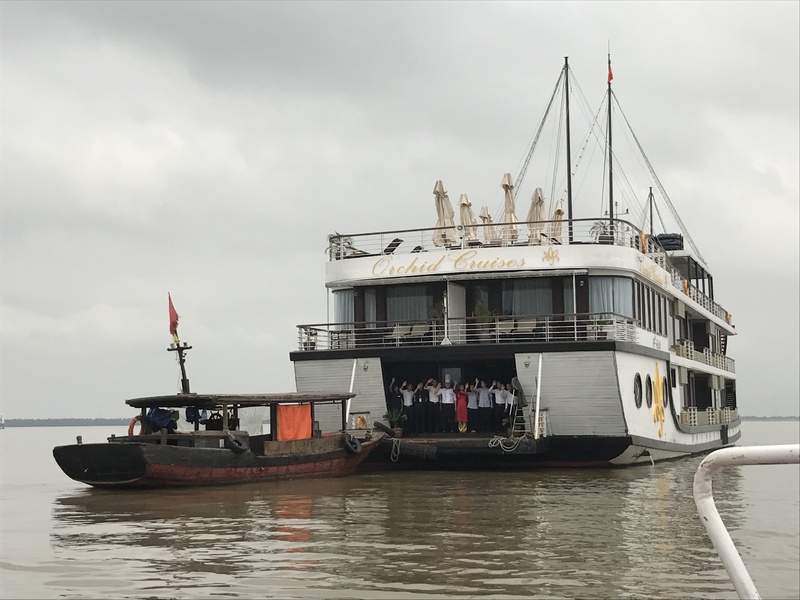 We said goodbye to the entire crew that accompanied us to the deck of the ship and greeted with the same beautiful gestures with the hands in the air and with plenty of cheerfulness on the faces. We were transported by the boat to the place where the cars were waiting for us to take us where we had to be. We went to the airport 🙂 But about our destination, as soon as possible! 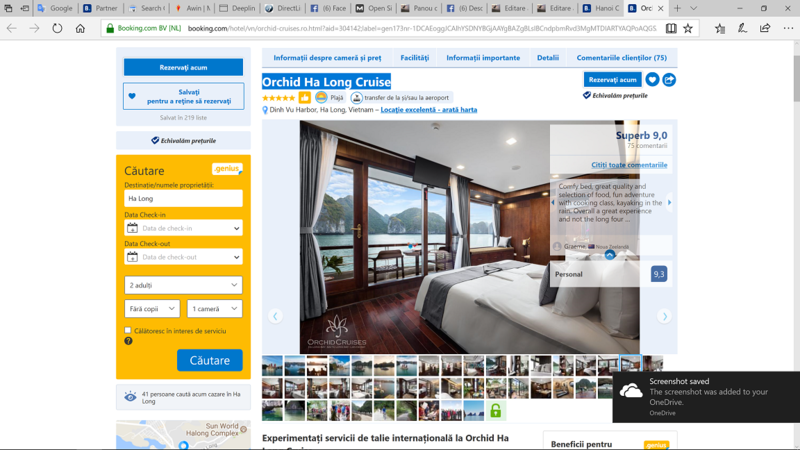 It was a great cruise and I recommend Orchid Ha Long Cruise, rated 9 on booking.com! 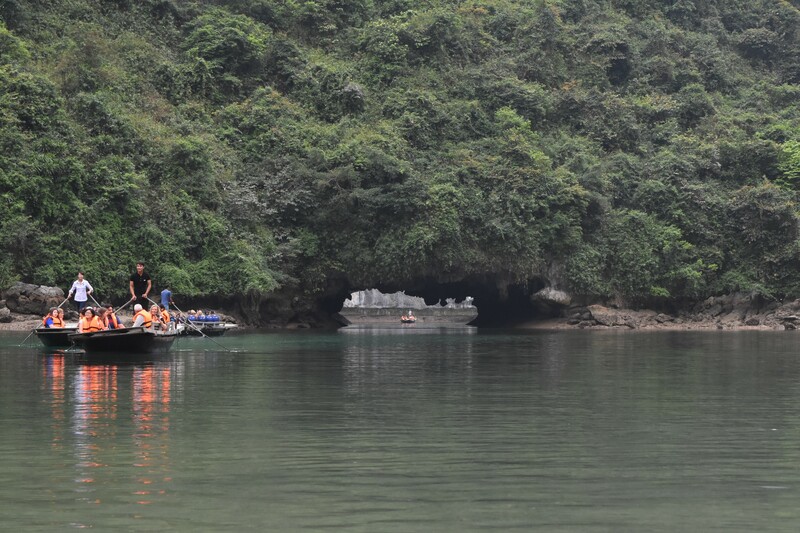 Halonghub is a site with everything you need to choose the best Halong cruise. Wow. 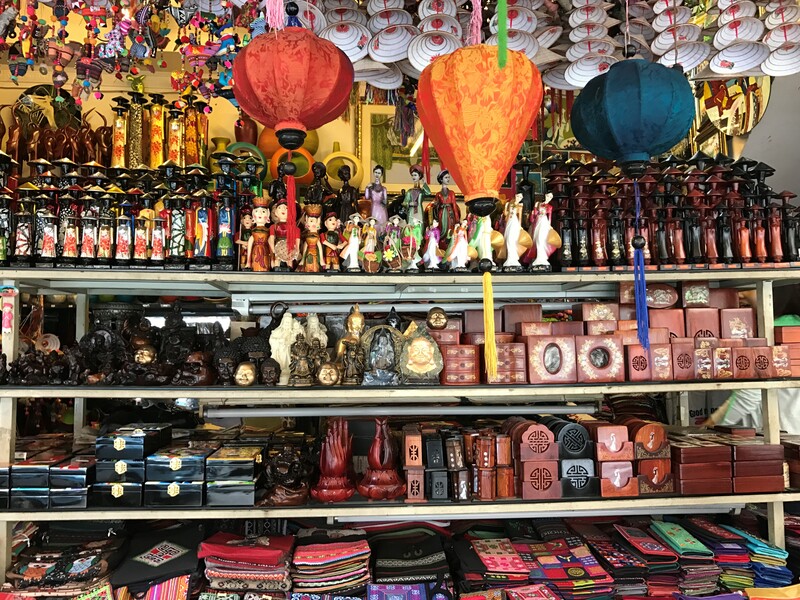 Your descriptions of Hanoi made me feel like I was there. Also, I was telling my mother the other day that if I visit Asia or SE Asia, I really want to take a cruise. I think it allows for more time of appreciating the scenery, just like this one. P.S. 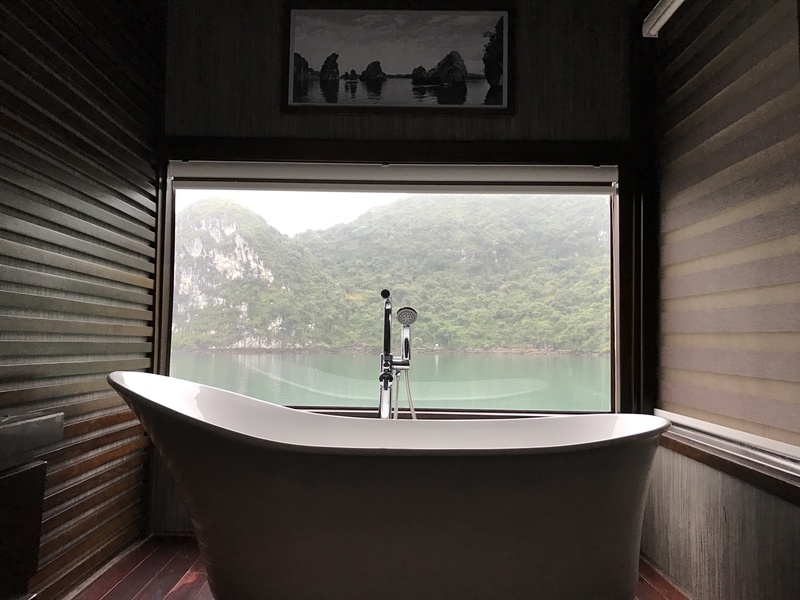 I fell in love with the tub and that view! 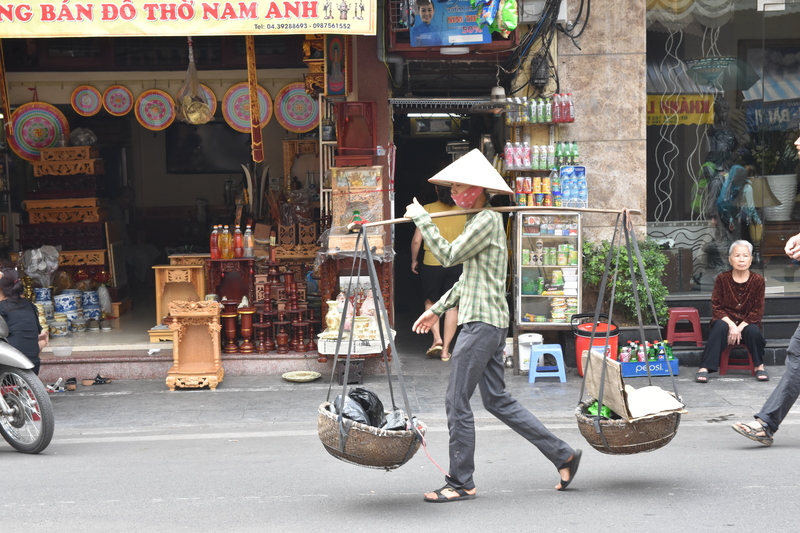 Oh wow – I’m hoping to visit Vietnam myself in a few years time – your post and photos make it very appealing. And the cruise looks amazing, that bath tub! Hmm, I might have to do this! 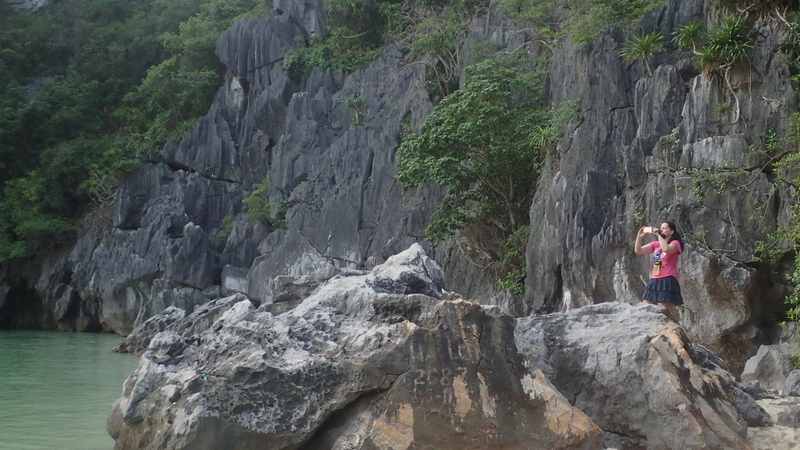 You should visit Vietnam, this beautiful country has many incredible places. Thank you! 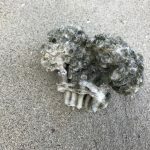 Very detailed post with great photographs. 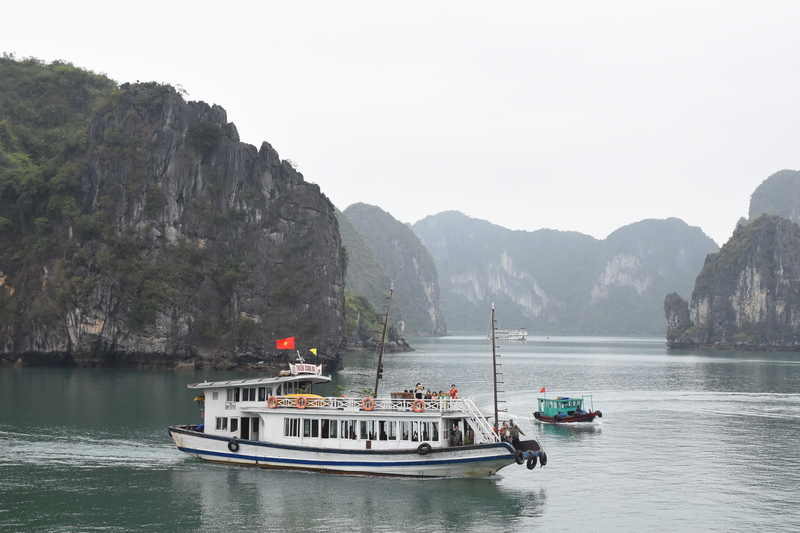 The cruise experience in Ha long Bay is very high on my list of places to visit. Your post is very helpful in planning the trip. 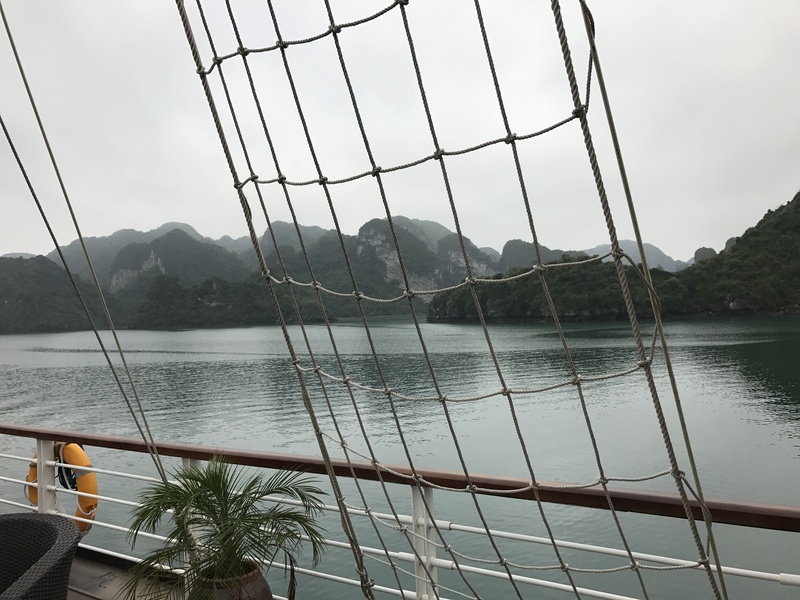 Ha Long Bay seems to be a very interesting cruise what with all the gorgeous pics and the way you described Vietnam 🙂 thankfully you went back before your husband totally panicked!! Laos or Vietnam?No, Laos and Vietnam | About various things! I really would like to visit. Sounds like a great cruise. I love that tub with the views I’d end up wrinkled lol. Oh my! This is all so nice! It is a dream of mine to visit this place (and many more in Vietnam). I identify with the feelings you expressed on the post. I have gotten super excited about a place and end up checking the weather like a hundred times before visiting. Sometimes conditions end up not being that good like with my recent Rhine River cruise (I will need to go back). 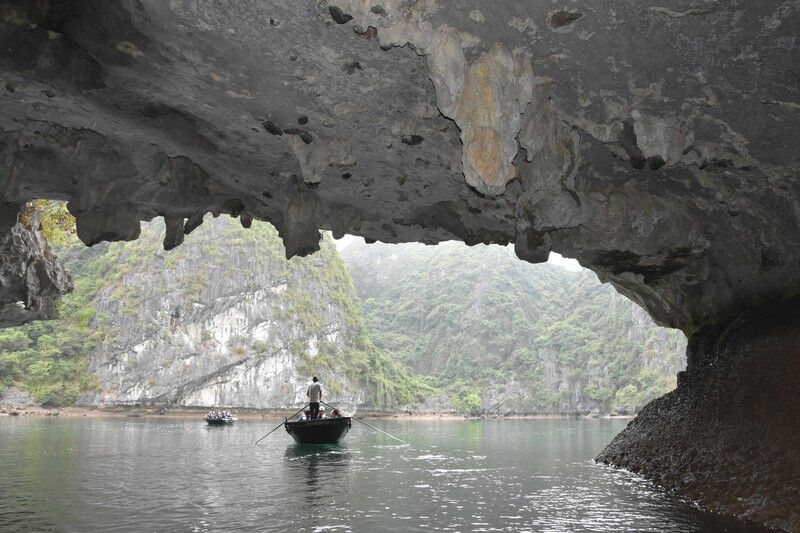 But, glad to learn more about Ha Long Bay (an dhow much it costs to cruise there). That Jacuzzi tub in your ship cabin looks incredible, I would have loved to see a photo of the ship you were on. And what beautiful photos. What an experience! It seems like you had such a great time. 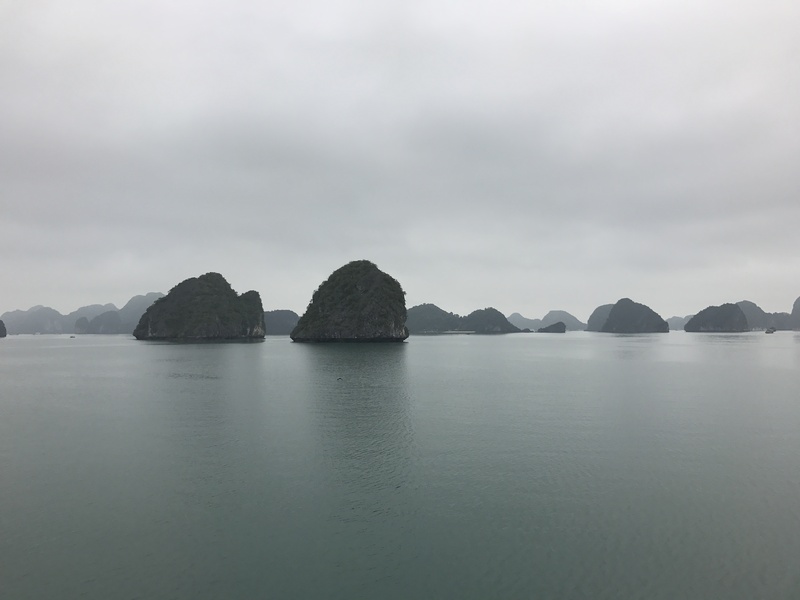 The photos show how beautiful Vietnam is and I bet that cruise was heaven. Vietnam is such a beautiful country. I’ve wanted to visit for such a long time. 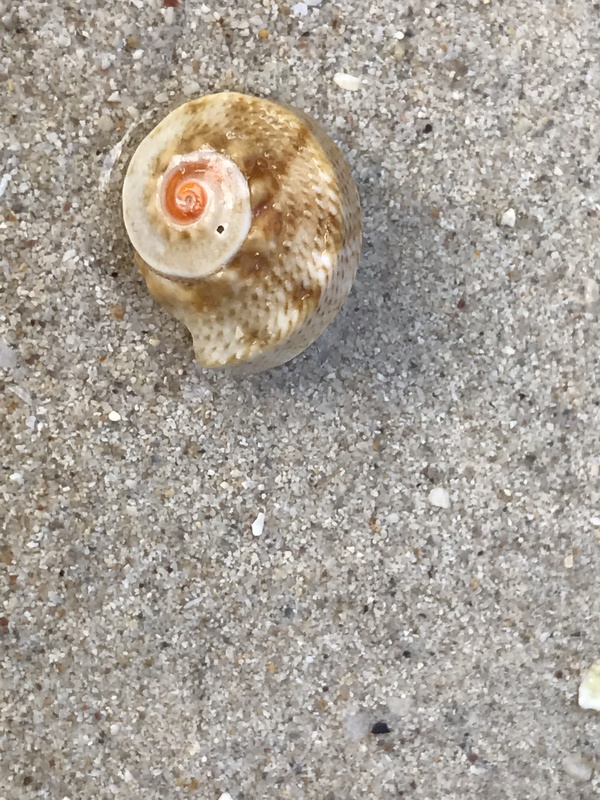 The beaches seem like heaven. Seems like you had a great experience. 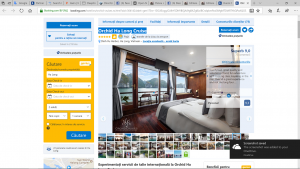 Thank you very much for your informative review about your Hanoi and Halong Bay visit. 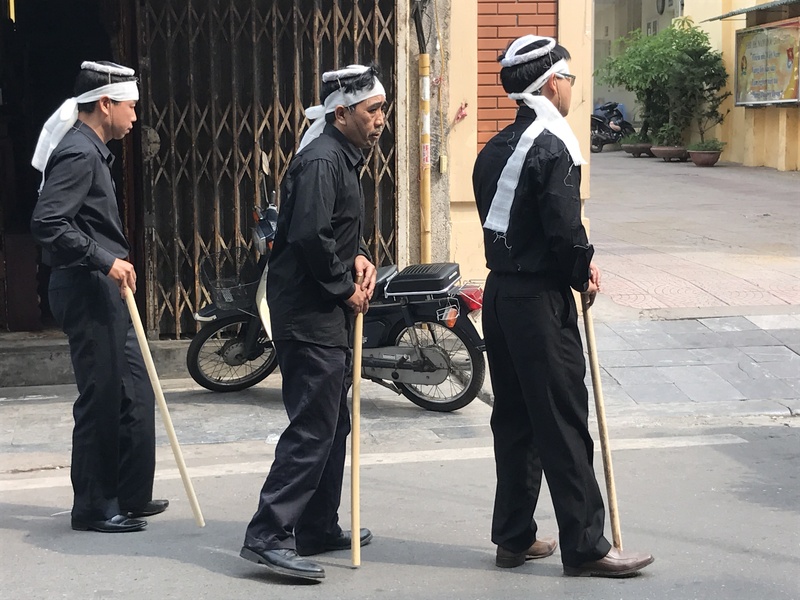 I am going to Vietnam next month and your post really inspired me. 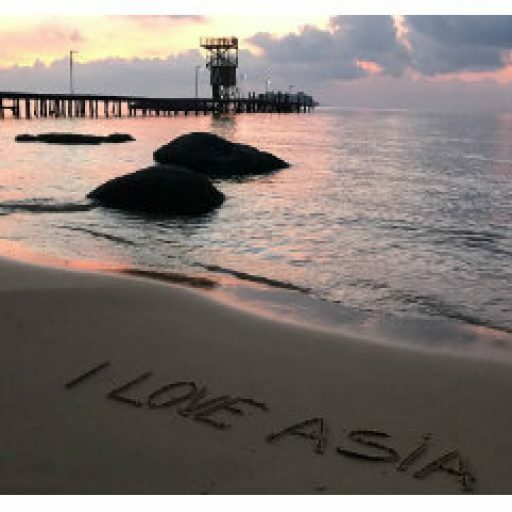 I’ve read your entire posts related to Vietnam and Asia travel and get ready for the next adventure. Thank you very much. thank you for this in depth description of your trip/cruise. I’d like to know if the price you gave (480) was for the cabin, or for each people?